Don't you just love when a fabulous meal comes together? We had this meal last night and it was such a great Summer meal! I could not help but go in for seconds. I had planned to only share the salad recipe but thought maybe it would be helpful to share both recipes to make a complete meal! I consider this a "fancy" caprese salad, mainly because it looks gorgeous when plated. 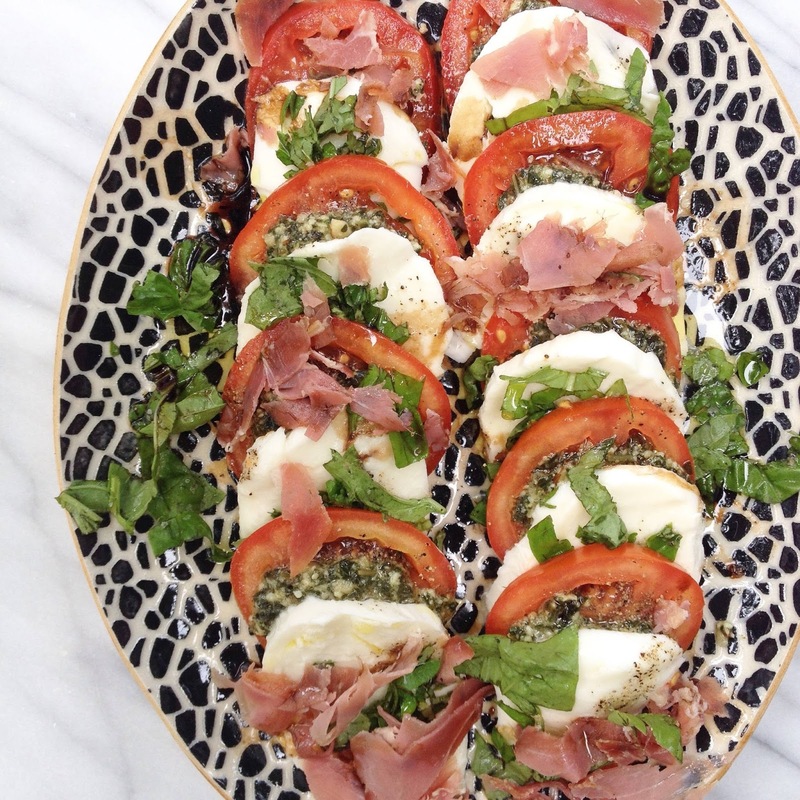 What makes this caprese a bit different is the addition of pesto and fresh prosciutto. This takes minutes to whip together and will wow any guests! I really recommend buying good prosciutto from a local butcher or sliced at the deli counter. It is so much better than the packaged kind. Funny story I went outside to clean up our dishes after dinner (we ate outside because it was such a beautiful night) and Rodney apparently saw the leftovers of this salad on the kitchen counter and ate it all. I had no idea he could even get up that high up but he licked the plate clean. Lesson learned never leave food out around Rodney. This salad is so fresh and vibrant, it could honestly be meal by itself if you wanted. You can definitely make this ahead too. I made it earlier in the day and then about 30 mins before we ate I set it out to come to room temperature. Layer tomatoes, pesto, mozzarella and fresh basil. Sprinkle thinly sliced prosciutto over the top. Drizzle all with olive oil and salt and pepper. Enjoy! This recipe came from one of my favorite cookbooks, Donna Hay Fresh and Light. The cookbook is fabulous, filled with so many great recipes and gorgeous photos. This dish seriously takes 5 minutes to assemble, it is so easy. The flavors of the thyme, lemon, and goat cheese pair together really well. They really are the perfect flavor combo. I bought smaller chicken breasts, so depending on the size you buy your cook time will vary. This would also be great paired with a beautiful kale salad or roasted vegetables. In a baking dish sprinkle the thyme sprigs on the bottom. Layer the chicken breasts. Season really well with salt and pepper. Add sliced or crumbled goat cheese. Layer on lemon slices. Drizzle all with olive oil. Bake at 375 degrees about 20-25 mins until chicken is fully cooked. 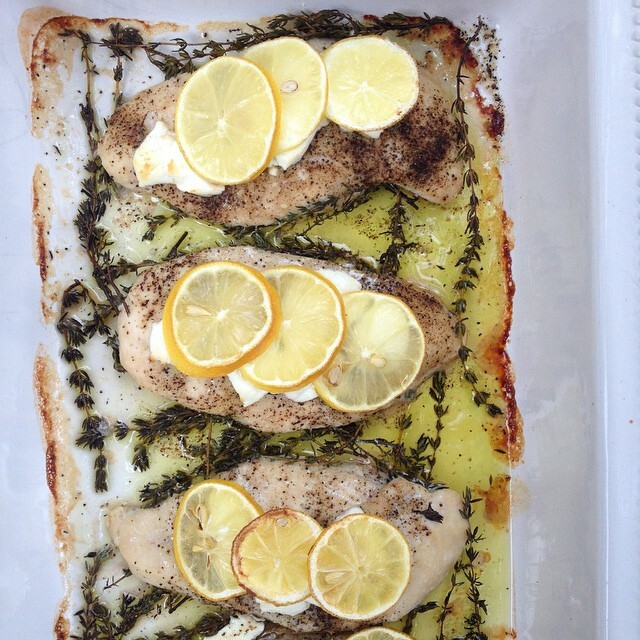 For the last 1-2 minutes I broiled mine to slightly brown the lemons and cheese. YUM! Both of these look amazing and how have I not thought to add pesto to a caprese before?? That chicken recipe looks great! I'll eat goat cheese on top of just about anything! Love that salad! I'll make it and sometimes add Trader Joe's breaded eggplant slices to make it a meal. So good. ummm yummmm!!! it looks so fancy and it isn't even too hard to make! seriously both look so good. hahah that's funny Rodney ate it all, I guess that means he has good taste! I made this last night for dinner. The hubs and baby girl loved it. So fresh and easy!! I made this last night. The hubs and baby girl loved it! So fresh and easy! !